When Does Art Become Multimedia? Recent discussions of Bernhard Hildebrandt’s A Conjugation of Verb both here and elsewhere have encouraged me to reconsider the idea of “multimedia” art. The installation is a clear multimedia experience, combining visual art with sound and video to convey meaning. When visiting the exhibition last week, a friend commented that he found the work especially interesting within the context of a collection dominated by more straightforward examples of visual art. His remark prompted me to consider the extent to which many, if not all, pieces of art in the Phillips can actually be seen as multimedia works. Take, for example, the Rothko Room. Unlike some of the Phillips’s more open galleries, this space is very small and intimate, eliciting silence and contemplation. 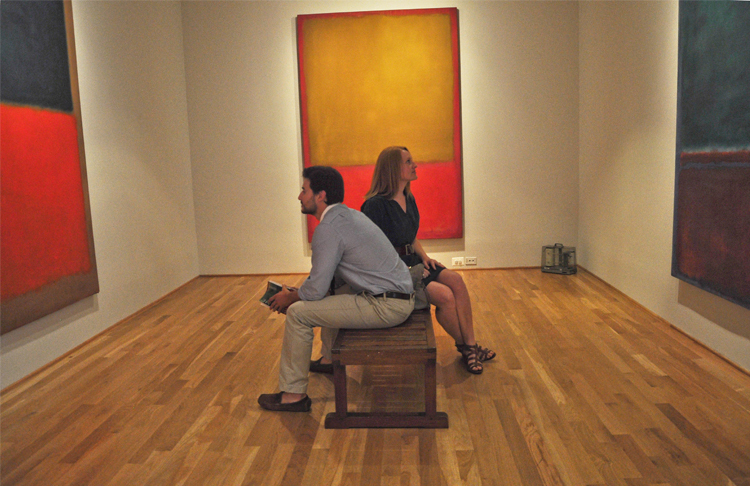 The layout of the room is also of note; when Rothko visited the Phillips in 1961, he requested that the furniture in the space be limited to a single bench. In this sense, though the four Rothko paintings are remarkable and evocative on their own, the experience of viewing them at the Phillips is inseparable from the experience of inhabiting the gallery itself. The space—from its size and attributes to its ambience and furnishings (or lack thereof)—can be considered not only a vehicle for viewing the medium of art, but a medium itself. We often don’t consider the ways in which the color of a wall or the lighting of a room affects our interpretation of an artwork. Yet all of these media, though traditionally seen as external to the artwork, form a context inextricably tied to our perceptions. With its carefully mediated spaces, Hildebrandt’s installation seems to make that concept explicit. What experiences have you had when place came together with art? This entry was posted in Experiment Station and tagged Bernhard Hildebrandt, Mark Rothko, multimedia, multimedia art, traditional painting, video art. Bookmark the permalink. You can still see Pontormo’s Deposition from the Cross above the altar of the family chapel in Florence where it originally hung. Seeing it in that space made me think so much about the artist and the specific circumstances that led to the painting being made. It’s something I still think about now whenever I see an altarpiece in more of a traditional museum setting.